The National Weather Service in Pleasant Hill (Kansas City) has issued a new info-graphic that more clearly defines how much snow each affected area can expect. A winter storm will impact the region bringing accumulating snowfall beginning late this afternoon and continuing into Tuesday afternoon, the Weather Service reports. 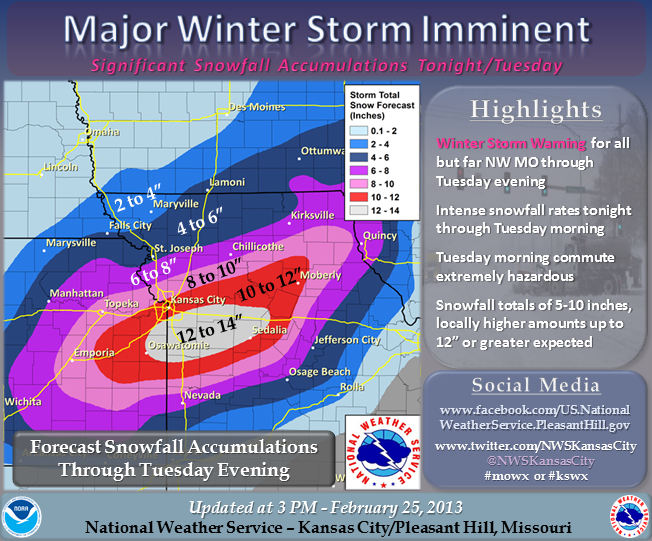 The most intense snowfall rates will occur from late this evening through Tuesday morning. Widespread snowfall accumulations of 5 to 10 inches are expected across much of the area, with locally higher amounts on the order of 12 inches or greater. The most likely area for the highest snowfall totals will be along a line from Osawatomie, Kansas, to Warrensburg to Moberly. Follow us on Facebook and Twitter for weather updates as details become available.